If your buddy’s carrying too much weight, it increases their chances of developing certain conditions. It can also make it harder to shake off a range of illnesses and health problems. Diabetes. The metabolic disorder, Diabetes mellitus (“sugar diabetes”) interferes with the way in which a dog absorbs energy into body tissues. Obesity is one of the main risk factors for it. It can be managed with the help of the vet - but as we all know, prevention is better than cure. Breathing problems. The vets call it respiratory compromise: i.e. if your buddy is carrying too much weight, this can cause or contribute to a range of breathing disorders. Brachycephalic breeds (like Pekes, French and other Bulldog breeds) can be especially prone to upper airway difficulties. Being overweight can make things worse for them. Lowered immune system. This increases their chances of catching a wide range of infections, and can slow down recovery times. High blood pressure (hypertension). As well as increasing the risk of heart disease, other areas of the body can be affected, including the kidneys and nervous system. Obesity also increases the risk of pancreatitis, osteoarthritis and altered thyroid function. Increased surgical risk. Obesity can reduce the chances of a good outcome from surgery, increasing the chances of complications, and lengthening recovery times. What’s a Chihuahua’s ideal waistline? Are you sure it’s “all muscle” on that English Bulldog? A podgy pooch doesn’t happen overnight. In fact, PDSA found that just 15% of dog owners recognise and admit that their dog is overweight, whereas the actual proportion of overweight dogs is around 40%. What exactly is your dog supposed to look like? What’s normal and healthy? Here’s who should be able to tell you: your vet and veterinary nurse. When you go in for their regular check-ups, always make sure you come away with up-to-date body weight and ideally a body condition score. Not sure what’s normal? Ask what your Buddy’s ideal weight should be. 15% over is overweight and 30% over is obese. How much you should be feeding them; how often and what type of feed. How much exercise they should be getting. The telltale physical signs that your dog’s diet/exercise regime might need to be tweaked. It could be a paunch at the belly, folds along the flanks, more bulk around the collar: your vet should be able to tell you what to look for, based on the breed type. How much Pooch’s weight has changed since your last visit. No need to struggle alone – join the practice weight watchers if slimming down gets difficult. Your vet’s advice on diet and exercise will change as your dog grows up. For adult dogs, these changes are usually pretty gradual, based on age, activity levels and any specific health considerations. Puppies are a different story: they grow up fast - and what’s “normal” can change pretty quickly, too. Ask your vet or vet nurse if they can recommend a good puppy growth chart for your breed. These can be an easy way of checking your little buddy is meeting their weight milestones between check-ups. Remember: if your pup reaches early adulthood at the right weight, it makes it much easier to stay that way as they get older. What harm can half a sausage do? 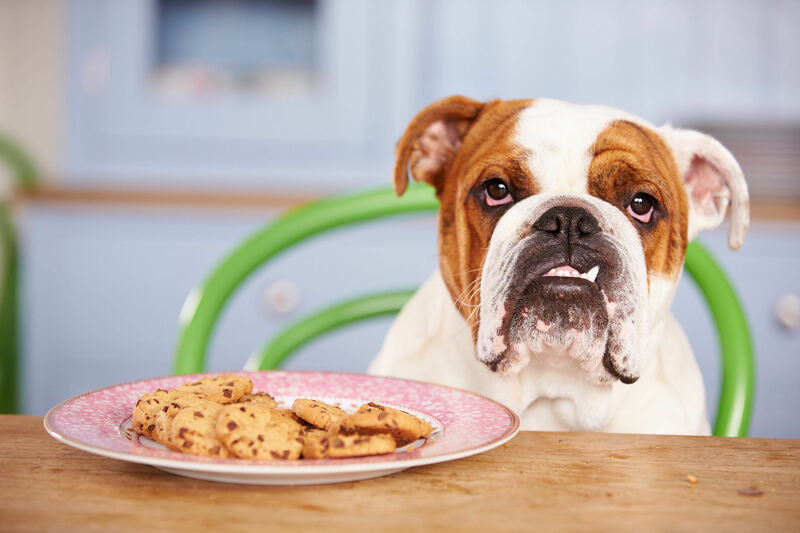 While a tidbit here and there isn’t the end of the world, if all members of your human family are treating your dog to stuff from their plates at every mealtime, it can soon add up to a lot of calories! Sometimes you have to be cruel to be kind. A household “no scraps allowed” rule is best for your buddy’s waistline and future health. Vets call it exercise intolerance. It’s basically a Catch-22, where a dog needs to take more exercise to get fit and lose weight; but the very fact that they’re unfit means they can’t handle the exercise. If you’re under vet’s orders to ramp up activity levels, a little-by-little approach usually works best adding a few minutes extra to your walk each day until you reach the right amount. This tends to be the recommended way to improve things like lung function, joint strength and overall stamina. Life can be complicated. Having to work , office relocations, taxi-ing to and from after-school clubs: lots of things can crop up and stop us from giving our buddy’s the attention they deserve. And if it means they aren’t getting their required exercise quota, it can quickly become a health issue. This is why a dog walking service can be such a godsend. To ensure you get a good one, you might want to check out the National Association of Pet Sitters and Dog Walkers (NARPS), whose members are checked and vetted. And especially if it’s just an occasional helping hand you’re after, Borrow My Doggy might be worth a look. Matching people who would like to spend more time with dogs with actual dog owners, it’s also a great way for your pooch to make new friends.